I spent this past Saturday at the baseball field watching my older two boys play in back to back games. I spend a lot of time at the baseball field but very little time actually watching any games since my youngest son would rather play the “run up and down the hill game” and the “jump off the bleachers game” than watch his brothers play and since he is more prone to injury, that’s where my eyes are most of the time. 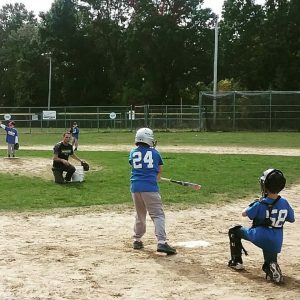 Here’s what I discovered about watching a bunch of 6-8 year olds play baseball. They’re not all that good at it. I don’t say that to be mean or snarky. It just kinda true. They’re little kids. They play for a couple of hours a week. They mess up a lot. Also, they forget stuff. How to hold the bat, which way to run, who to throw the ball to. The league that my son is in is a coach pitch league, which means – you guessed it – the coach pitches. As I sat and watched pitch after pitch, there were lots (LOTS) of foul balls. I recognized the most common thing the coach would say to the kids was “take your time, don’t rush”. Every kid approached excited and ready to go. They’d want to swing at the first sign of movement. They’d wildly swing and spin themselves around with abandon making me nervous for the catcher’s head every time. Now, a lot of the kids would get frustrated as the struck out or fouled. Understandable for this age. When they watch the Red Sox on TV those guys make it look so easy! Why isn’t it easy for me? Why do I have to remember so many things? This isn’t fun, I want to quit. As a parent of a frustrated 8 year old, it seems like a no-brainer to explain to your child that professional athletes have practiced A LOT. Explain that they’re doing great following the coach’s instructions. Explain that it’s a learning curve and it will take time to master any activity and quitting just means you’ll never master it, so what fun is that? Looking inward, it’s much harder to explain those same feelings to myself when they relate to something that’s hard for me. How often do you get frustrated because someone else makes it look easy? Whatever “it” is. How many times have you rushed into something and swung wildly without understanding the necessary steps that would make you successful? Are you “striking out” because you’re not taking the time necessary to accomplish something correctly? Recognize that in some areas of life, we can be Big Papi and in others, we’re the 8 year old little league player. Both of those are ok. Being an expert is ok, being a beginner is ok. Never put yourself down for being a beginner. It means that you’re stepping out of your comfort zone and trying something new. That’s brave. Own your beginner-ness! Get instruction, ask questions, and believe that you can master any skill that you decide is worth your time and energy.